Phuket and Krabi seem to be winter getaways for Europeans, whose appearance stands out among the oriental look of the Thailand people. An obvious observation is the attraction of the European men to the young Thailand women. It is not uncommon to see European men accompanied by a Thai women around town or at the beach. The towns are similar to the towns found in the Caribbean, they are in different states of rebuilding and poverty. The areas for the tourist are in prime shape. Motor scooters are the main means of transportation mixed in with some unfamiliar types; Tuk-Tuks, sawngthaews, motosais and the water transportation of the long tail boats. 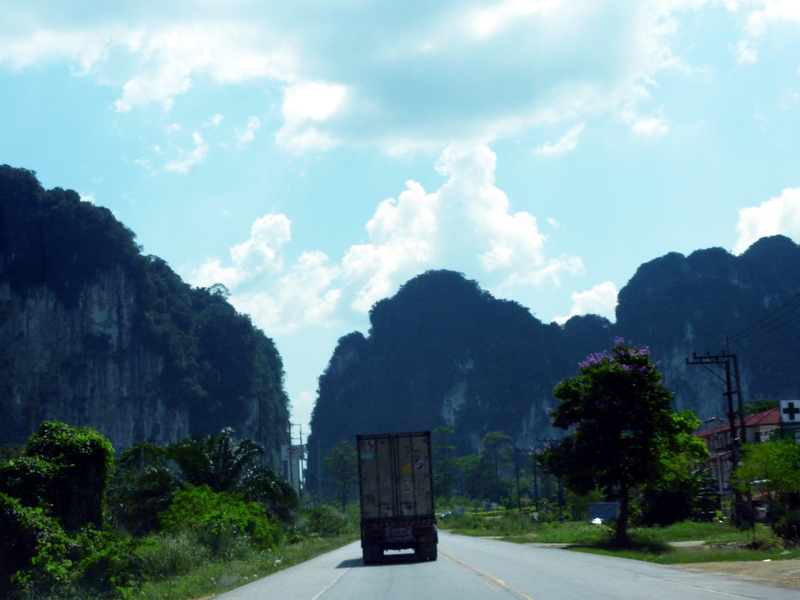 After 10 days at Kata Beach we rented a car and drove on the left side of the road with the steering on the left over to AoNang in the Province of Krabi. Once off the main highway, you are on your own as far as directional signs go. In the middle of the 5 hour drive was a horse shoe curved, jungle covered, mountain road that lasted about 1 hour before we came upon a work crew cutting back the highway overgrowth. The AoNang beaches are not umbrella beaches for there are trees to provide shade. The beaches in Phuket and Krabi are great beaches but I think that the USA has a greater variety of winter getaways than the Europeans. One big Thai advantage is the food and lodging are about one third the cost of USA getaways. A lot of long tail boats operate from the beach offering excursions to the limestone cliff island beaches offshore. We found the beaches in AoNang completely fantastic and unique. At low tide you can walk out to some limestone cliff islands near shore. AoNang is more laid back than Kata beach and especially Patong beach. We stopped over for one night at Patong and it is a beach city with all the amenities that big city beaches have. The beach was way overcrowded. AoNang hardly has any bars, so there is no nightlife, making it a completely different atmosphere. After 2 weeks of beaching in 90 degree heat we felt loosened up and and completely prepared to tackle the overnight flight to Sydney and the overnight train to Melbourne to attend the Australian Open. We flew back to Bangkok for 2 days of urban life to get ready for the city pace. We stayed at the same hotel that when we first arrived in Thailand and were surprised that we were greeted with an upgrade to their best suite. 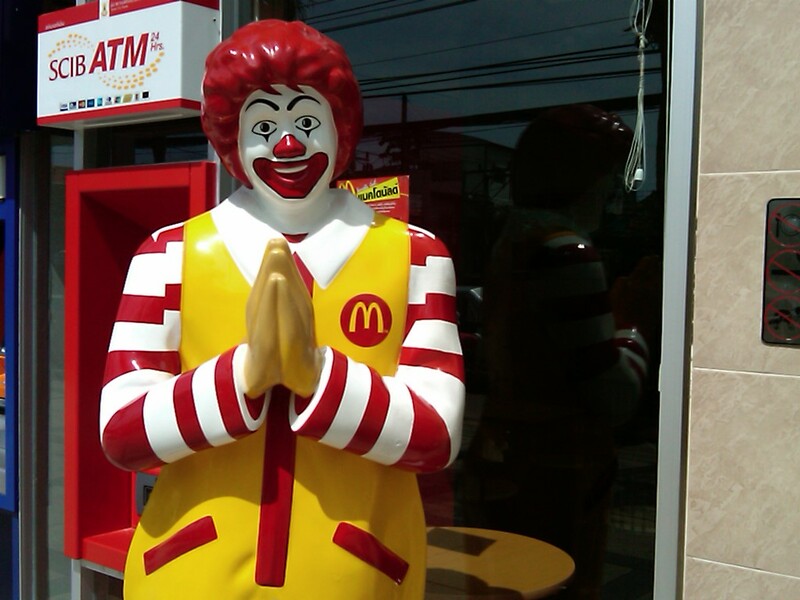 One thing about the Thai people that we came away with is that the clasping of the hands together and a bowing of the head is genuine. Mike, Thanks for the comment. I am glad you enjoy the blog. I am trying to find time to put up the Australian Open page. It was great in Melbourne. We had great seats, weather and saw some great tennis. Being that close to the tennis made me think how TV just does not do justice on how hard the pro’s hit the ball. Maybe it is time for different positions of the TV camera on the court. They have been in the same spot for a long time. I have been reading about the snowmageddon in the USA(no comment). Too bad about Peter, he will be back. Your slice should be bothering everyone. Did you see how Federer used the slice against Murray? Murray played good, but he needed his Nadal game. Murray against Nadal was the best I have seen Murray play, top player stuff. Keep the driveway clear for the getaway to Tri-City.